We thought it was good to soak up the sun when we were young, and now our pre-cancerous lesions are showing their ugly faces. Irwin and I have both been told by our dermatologist to stay away from the Greek Islands. After four years of warnings about the intensity of the sun on these islands and in other tropical climes, the doctor has given up. But we haven’t. We now have long-sleeved swim shirts, and though it may sound silly, we sometimes swim with our sunglasses and hats. I don’t exactly feel like a bathing beauty but at least I don’t burn my head off. When we leave our Greek Island or Nicaraguan hotel in the morning, we apply 60–100 SPF sunscreen (yes… I know they say it’s useless after 30, but I feel it lasts longer when the UV protection is higher and it feels less greasy). Then we reapply it every couple of hours. My legs can be particularly sensitive to too much sun and I sometimes get heat rashes if I don’t cover them. So longer skirts and light cotton tops with sleeves are a must, especially during the hottest part of the day. I save strapless sundresses, tank tops, and t-shirts for evenings. For men, longer sleeved shirts and longer shorts or pants are necessary. On the beach and by the pool, the sun is more concentrated and you burn more easily. Try to find a café on the beach with shade. It’s much more enjoyable than baking on those recliners and then later paying for the pleasure of burning in the sun. We spend hours in these beachfront cafés playing chess or reading and occasionally going out for a swim. The best part is we can leave our belongings on our table and tell the waiter to guard them. They always do. Always avoid the beach during the peak hours of sun, from 10 am to 4 pm. We enjoy the late afternoon hours when beaches are usually less crowded — although it may be harder to find someone to babysit your stuff. Take only a small amount of money when you go to the beach. Put the rest in your money belt and lock it in the safe in your room, along with your cards and passports. Or, most front desks have safety boxes, either for each room or for everyone. Sometimes front desk staff will tell you to put your money belts in an envelope — some even count the money with you, seal the envelope, and have you sign it. valuables there. Open safety boxes and visible passports are a bad sign. Avoid taking jewelry, especially gold and silver, on your vacation. We remove all our rings and gold and silver chains. Leave expensive watches and prescription glasses at the hotel when you beach it. We will often leave our clothes and other belongings with people who are more “planted” on the beach than we are. You can partner up with other couples and watch each other’s belongings while one couple is in the water. If there are trees or umbrellas, hang your stuff up as high as possible so it’s visible from the water. Always mark your spot with a bright piece of clothing. To answer that question you are waiting to ask… no, we have never had our belongings stolen on the beach. But we have almost disappeared. It was on the isle of Naxos two summers ago. When you see frothy waves, even if the water is shallow for a long way out, it’s a sign of danger. We walked out quite far and were talking obliviously about our future when we were caught in an undertow. A huge rolling wave seemed to come out of nowhere. It enveloped us, and without breaking, it carried us out into deep water, far from the shore. I began to do my signature combination side stroke and dog paddle, trying to keep pace with Irwin, who’s a good swimmer. He somehow managed to tell me to grab onto him, and when I tried, he started sinking. In that second, I realized I was on my own and I would die if I didn’t get myself to shore. It was a long way off and we seemed to be getting nowhere. My arms were aching but I kept on telling myself I was going to make it. We were too far out for anyone to notice we were in “deep” trouble and there were no lifeguards, which is often the case on our islands. Finally, after what seemed an eternity we made it, Irwin one body length ahead of me. We were in shock. Somehow I managed to go around to the mothers whose children were far out in the water and tell them about the dangerous current. They thanked me and fetched their kids. We made it back to our hotel and didn’t leave for the rest of the day. Our brush with death made us realize we had left no information about how to contact our children should anything happen to us. We now leave their emails at the front desk in case of emergency. That evening, a jewelry shop owner informed us that a man had drowned on that same beach just two weeks before. He had simply disappeared. And we understood why. So we learned it’s very important to know your beach before you swim. Ask the locals how safe it is. If you see those frothy waves, keep away from them, and always swim parallel to the shore. I’m not invoking God at all, but I have often wondered why it was that just a few weeks before the incident, I began training myself to swim in deep water without fear. I would swim out after Irwin and then back, building up my strength little by little. Without that, I wouldn’t have survived. PS – If you’re looking to buy those long-sleeved swim shirts, they can be hard to find. We’ve found them at Mountain Equipment Coop in Montreal, in the US, and online. 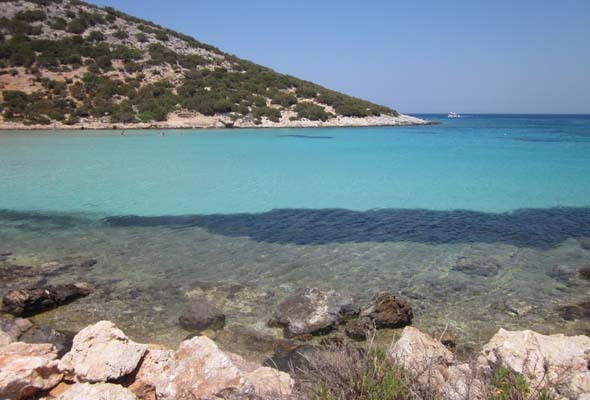 Be the first to comment on "Greek Islands: Where life’s a beach, keep yourself safe"